Thom Yorke has never gone for the emotional jugular. Ever since Radiohead launched into the stratosphere with Ok Computer in 1997, his aim was for the cerebral, not emotional. The debut from Atoms For Peace is like James Joyce in a world of Stephanie Meyer. Lose attention for a moment and the skittered rhythms and swooping bass lines will dissolve and shift into something else. Thom Yorke’s laptop science is brought to life and given legs and arms to flail. 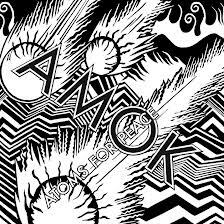 Far from being Yorke’s solo debut under a different name, Amok is clearly the creation of a band. Loose and spontaneous, the melodies cartwheel around Flea’s driving grooves and the percussive power of Joey Waronker and Mauro Refosco. Chopped and flipped by keyboardist and producer Nigel Goodrich, the end result is a psychedelic mix of African rhythms and Blade Runner technology. The ride isn’t always easy – the out of key spike notes in “Before Your Very Eyes” are fingers down a chalkboard and the intricate cross rhythms can be clawing instead of caressing your throat. Often it sounds as if everyone is on a separate tangent, like they recorded deaf and blind in different rooms. It’s not a ‘sum of its parts’ situation though: tracks such as “Judge, Jury and Executioner” flow around the central Flea bass line and “Reverse Running” has an unusual focus – on Yorke’s often hidden vocals. Unlike Radiohead’s beat driven and coldly distant The King Of Limbs, Amok is warm- the sound of Thom Yorke starting to finally ease into the sound and enjoy the rave. 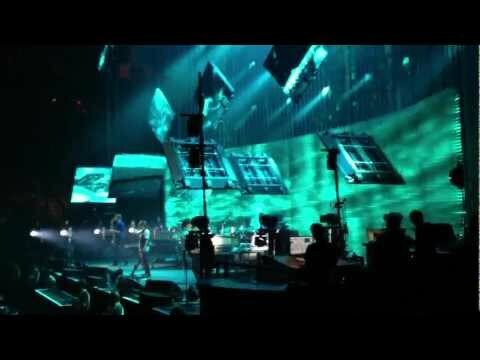 Continuing their habit of dropping new songs on unsuspecting audiences, Radiohead debuted Full Stop during their set at Finley Park, Illinois, a few nights ago. Previous song, Identikit, was a creepy and rhythmic ballad, and Full Stop tumbles further down the rabbit hole with droning keyboards and heavily scattered percussion. Towards the end it sees Thom Yorke chanting’The truth will mess you up’ over a racing backing before breaking into wailing harmonies. Have a listen, and let us know what you think. Don’t listen to this song whilst you’re on the road. Because the resulting mind-trip that this song will send you on won’t be conducive to good driving. It’s just…Radiohead, pure and simple. The creative genius of a brain that resides within Thom Yorke doesn’t appear to be getting old- if anything it’s getting better. Identikit is the same poppy drum patterns (think 15 Step) with Yorke’s vocals wound around them; an atmospheric sound-scape destined to lull you to sleep. The beat is infectious, the twin drummers hiccup their way through the beat, sharp snare notes paired with feathery hi-hats. Yorke’s vocal enter, and the falsetto drifts around the drums, wafting down the register. Harmonies initiate an ethereal call and response just to make everything that little bit more airy. The effect is quite disjointing and jarring. 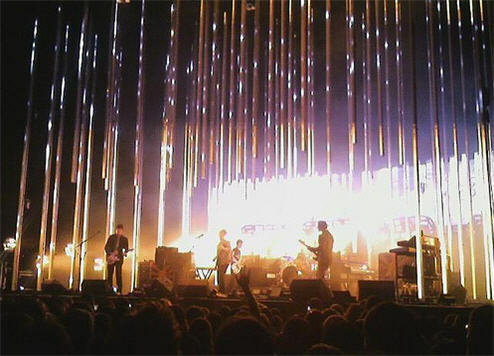 The change occurs about a minute in, in typical drastic Radiohead style. A synth sustains high wavering chords, above a newly introduced bass that bobs around the pulse. It then opens out a bit, the guitars coming to the fore to pick out notes whilst the synth wafts about. The drums are still hiccuping everywhere, but this time it is less disorienting because the synths and guitars hold it all together. It’s them at their best, making brilliantly textured tracks that are more snapshots of different sounds slammed together than ‘proper’ songs. The changes between the sections are smooth and easy, even though the changes being made are quite big in terms of melody. It’s comforting to know that the most progressive band around today are still creating amazing tracks, and that the best may be yet to come.